From the see you soon department... Bavu Blakes has been a been a force in the scene here in Austin and it's a shame that he'll be moving away. Austin Hip-Hop Scene wishes the Blake's family all the best and success in the future. 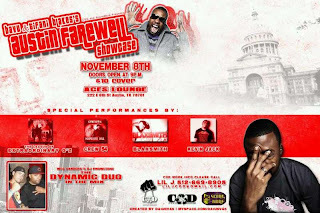 So let's all give Bavu & Tifani Blakes a warm Austin farewell @ Aces Lounge tonight!